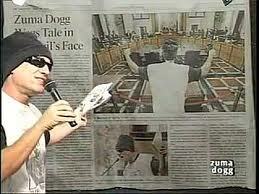 ZumaDogg.com: Los Angeles Homeless Advocate ZUMA DOGG STATEMENT on FUTURE of L.A. Homeless Crisis Given Measure H & HHH and Current City Hall Administration: AN URGENT ALERT! Los Angeles Homeless Advocate ZUMA DOGG STATEMENT on FUTURE of L.A. Homeless Crisis Given Measure H & HHH and Current City Hall Administration: AN URGENT ALERT! RE: LOS ANGELES HOMELESS CRISIS: Big meeting in Venice, last night, with over 500 people NOT TOO HAPPY WITH L.A. City Councilman Mike Bonin and US Presidential Candidate, ("sort of" L.A. Mayor) Eric Garcetti. PIC: I've been presenting ALL the ways L.A. City Hall has been creating a homeless crisis since 2006! "PEOPLE...do NOT expect the homeless crisis to reduce. Expect it to INCREASE. We The People of Los Angelges must now accept as the new reality...LA City Hall did everything to create this crisis; including Garcetti going on international TV and saying we accept your homeless from around the world -- and all the stuff on the agendas for 20 years...WHAT MAKES ANYONE THINK THE SITUATION IS GOING TO IMPROVE AND NOT CONTINUE TO GET WORSE? Measure HHH & H money? That is all for administration (HIRING PEOPLE/GRAVY TRAIN!) And, all the housing it creates isn't evaporation on a drip in bucket. Hasn't the city been TRYING to do something about homeless? So, now...we'll REALLY try. It's check mate! LA has been designated as Homeless Capital of the world. Bring us your hungry, your tired, your broke, your uneducated...your degenerates...your mentally ill, your drug addicts....they may set up tents on our sidewalks. Ever notice not a tent on the sidewalks in Santa Monica; literally RIGHT ACROSS THE STREET?" Hmm." I DID DECLARE THIS #1 issue during 2017 mayoral campaign; and predicted this, TO A "T" first month as gadfly, just by observing the council and what they were doing. SO, here we are! Remember my article, "Planning For Disaster" in LA Weekly? THIS WAS PLANNED. People stayed home and left it to Zuma Dogg and Matt Dowd; and we lost the city. I just want people to know=THIS IS IT, BABY! STOP THE MADNESS OF THE CHARADE and NO FALSE EXPECTATIONS. You don't like the way the city looks=you gotta move. it ain't gonna improve=only worsen.